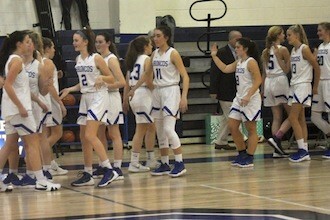 Feb. 6, 2019: Last Friday night, the girls' and boys' basketball teams played in the annual "Bronco Bonanza," a schoolwide fan night and celebration of basketball hosted by the Bronxville High School Athletic Council. 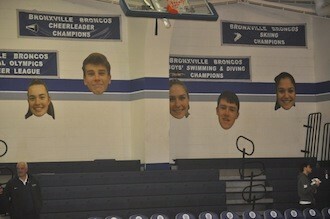 At the Bronco Bonanza, the girls’ team decorated the gym with colorful posters, and “fatheads” of the senior basketball players adorned the walls. Proceeds from the snacks sold at the games will be donated to Hoops for Heart, a national fundraising campaign that promotes physical activity and healthy heart living. 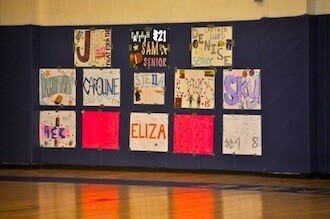 The walls of the main gym during Bronco Bonanza. Both teams faced Keio Academy on Friday night. The Bronco girls, who played first, were leading at halftime 28-8. 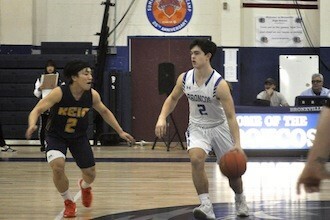 Keio came back in the third quarter matching the Broncos basket for basket, but Bronxville prevailed in the end, winning by a final score of 52-32. 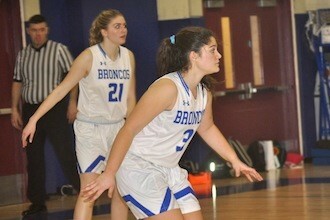 The Bronco girls in the win over Keio. Scoring for the Broncos were freshman Ashley Wetty (14pts), senior captain Denise Kinas (10pts), sophomore Stella Daskalakis (7pts), senior captains Jenny Pettee and Samantha Huss (4pts each), sophomore Lindsie Schultz (4pts), and freshman Kiki Tormey (4pts). Senior Captains Denise Kinan (21) and Samantha Huss (3). The Broncos play in Section 1 League 3B, which includes Edgemont, Rye Neck, Blind Brook, and Keio. The girls are 2-2 in their league and 4-9 overall so far this season. 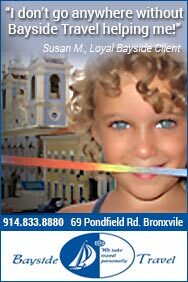 In front of a small home crowd, the Broncos and Unicorns were evenly matched in the first quarter, but Bronxville pulled ahead 21-13 at the half and won with a final score of 47-28. Griffin Harblin scoring the Broncos. Freshman Chris Kelty (12pts) and senior Cory Ramundo (8 pts) led the scoring for the Broncos. Also contributing to the scoring were freshman Griffin Harblin (7pts), senior Ashton Smith (4pts), and sophomore J.P. Swenson (4pts). The young Bronco team is 5-8 so far this season. 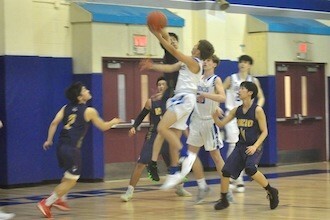 Point guard Henry Donohue (2) in the win against Keio. It is a family affair for the Broncos this year, as there are two sets of brothers on the team. Cory Ramundo, a senior, is playing with younger brother Riley, a sophomore, and senior Tim McGrath is playing with brother Sean, just an eighth-grader. The boys have four games in the next week. 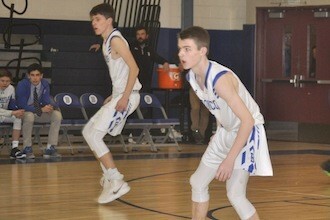 They will play at home in their last regular season game next Wednesday against Blind Brook at 6:00 pm. The Bronco girls have five more games left in the season. 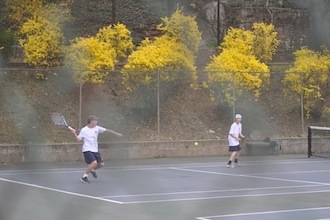 They will play at home today against Rye Neck at 4:30 pm and again at home on Friday against Ardsley at 5:00 pm. 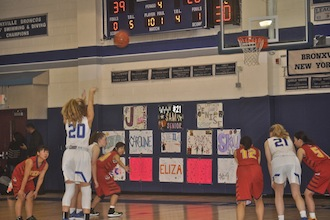 Pictured at top: Freshman Ashley Wetty (20) shooting from the foul line during the Keio game.